So she wrote herself a property wish-list – elevated site, sun, sea view, native trees, running water – and put her beach house on the market. The spot she found near Peria, ten minutes inland from Mangonui, was less than ideal – no sea views, running water or native bush, just lush farmland for kilometres around on which she’s had to plant every tree. But at least the property is elevated, she points out with a laugh. Dhaj set up home in a caravan on the site with the idea of building an earth home. Everyone thought she couldn’t do it but that just made her more determined. The spritely grandmother (now a great-grandmother) assumed she would have to build it out of rammed earth. It wasn’t the premixing or curing that worried her but the lifting. Since she didn’t know much about the process she contacted the Northland Craft Trust in Whangarei. There she met two people who changed her life: legendary artist, potter, sculptor and teacher Yvonne Rust, who became her mentor, and the “multi-talented” Henery Makeson. At that time, a student at the trust had been constructing a wall out of premixed adobe – a blend of clay, sand and cement. Instead of pre-forming the bricks, they were shaped on the wall using a mould (bricks made in this way are called in situ bricks). The wall needed to be tested by engineers but it impressed Dhaj as she realised she could make any shape she wanted and “even old ladies could build with it”. The engineer’s report was encouraging, so plans were drawn up and Dhaj began work on the first in situ adobe home in New Zealand. The final result was so successful that she began teaching the technique alongside Günther Andraschko, an Austrian she met when he did some work on her house. They tutored adobe courses for three years around New Zealand and across the Tasman. “We had a huge amount of fun,” says the trailblazer, “and we learned heaps as we were going.” Being able to modify and make changes as she worked was a large part of the appeal. To break up the density of the adobe, for example, Dhaj inserted coloured bottles here and there. Then one day a friend dropped by on his way to the rubbish dump with a broken bowl; rather than throw it out, Dhaj used it to begin a mosaic wall that evolved bit by bit. “I liked the raw, organic nature of mosaic but I got a bit fancy in the finish, using big pieces,” she admits as she walks around the property, where little is left untouched by her love of the art form. Barbecue tables, a fireplace, the goldfish pond – patterns and pockets of mosaic colour are everywhere, some finished with the “mosque top” or minaret shape that has become a signature of her work. These days, Dhaj tends to do just the drawings rather than the hand work of her craft. 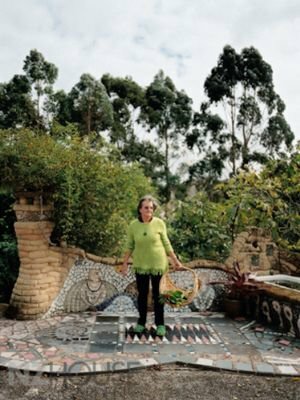 But she’s proud to have been associated with, among others, the adobe mosaic “seat” in Kawakawa – which complements the famous Hundertwasser toilets – and a piece at Te Puna Quarry Park in Tauranga. Feisty Dhaj has also pushed adobe to its limits, trying to round out corners and eliminate as many straight lines as possible. Eventually she added paper to the mix for fibre content, to help with shrinkage and guard against cracking. Her home has been intriguing Kiwis for years. The design is fairly basic – a simple open kitchen/dining area with a wood burner and a pantry tucked into the corner behind an adobe wall. There’s a step down to a central area and the adjoining bathroom with its mosaic mirror surround and shower floor. A large spare room has a treetop-style bunk that’s been a popular spot with the grandchildren, but Dhaj’s favourite space is her bedroom, which she calls her nest. For someone who was told at thirteen that she had no talent and to forget about art, she has shown a remarkable commitment to the creative impulse. She has always loved craft work and did weaving for many years, which was immensely satisfying. “But I just love building,” Dhaj says. Her latest project is her old caravan, which has been adobe plastered inside and out with the idea of making a retreat for visiting artists. Henery Makeson was drafted in to help out on the project. “He doesn’t like straight lines either.” She has installed a gas shower (mosaic work included of course) and a kitchenette. Dhaj has slowed down since her fall but is as irreverent as ever. “I don’t have a concrete mixer any more. I’ll have to advertise for a new man with concrete mixer,” she jokes. Since damaging her shoulder she can’t chop wood either, but she’s reluctant to move house. She still has plenty of ideas though, which she readily shares with her son Brent, who lives nearby in Taipa where he makes Alchymia wood-fired ovens. Brent is also a respected sculptor who travels a lot to complete commissioned work, teaching sculpture along the way. Inspired by his mother, he has created his own eco-friendly architectural sculpting compound called Darjit, made from a by-product of the Matauri Bay Clay Works. It’s finer than talcum powder and “wickedly difficult to work with,” explains Dhaj, but he has found a way to mix it with paper fiber to create a finish for interior and exterior purposes.